Does your car have a short fuse? That is, are you having electrical issues, such as flickering lights, power window glitches, or car battery problems? Whether your lights aren't working or battery is being bothersome, you can trust the team at our auto repair shop to identify the problem and fix it quickly. Since today's auto electrical systems are rather complex, you need ASE-certified technicians to provide accurate auto electric repair in Powell, OH. 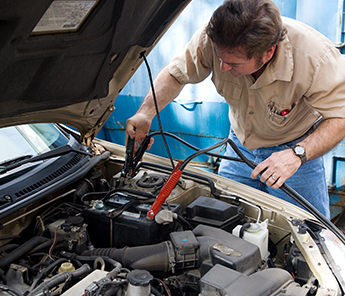 Get off to a good start by depending on Wayne's Auto Repair Powell for auto starter repair. Do you hear a clicking sound when you turn the key, but your car doesn't start? If so, more than likely, your car's starter is going bad. Another indication that you need car starter repair is the time it takes to start your engine. If the battery is fully charged, but the car takes a bit longer for the engine to turn over, bring your vehicle to us. We test your starter to see if it needs repair. It happens to everyone. You get in the car and turn the ignition, but the car won't start. What are you to do? Turn to our team for car batteries. We diagnose problems and install new batteries. Because we are a NAPA AutoCare center, we carry batteries for all makes and models. Instead of taking the time to remove your old battery and install a new one, allow our auto technicians to do the work for you. Voltage meters, auto wiring, fuses, and computers. Do you really want to mess around with these vehicle components to locate the wiring problem in your car? Let us do the work for you. We have the tools and experience to identify the issue quickly. In addition, our certified technicians repair the problem correctly and affordably once they find it. From battery changes to new wiring to alternator replacement, our technicians do it all. Contact us for complete electrical diagnostics and auto electrical repair. We proudly serve customers in Powell, Lewis Center, Delaware, and Dublin, Ohio.